Large-screen LCD with backlight clearly displays the electric power of each phases and their total on one screen. Capable of displaying small currents of 1 mA or above. 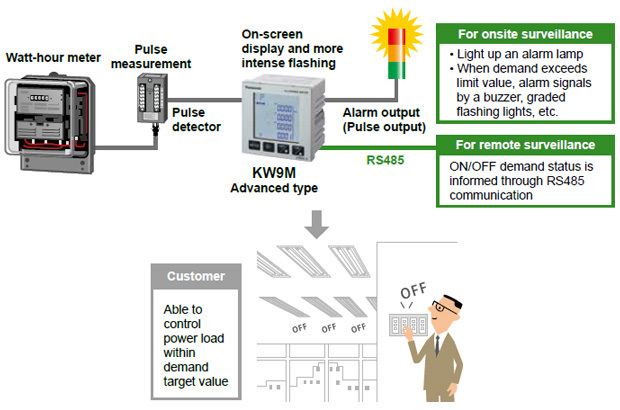 This allows for the monitoring of standby power consumption, which helps energy saving. * Capable of measuring 0.1 % or higher the rating of the secondary side of CT. 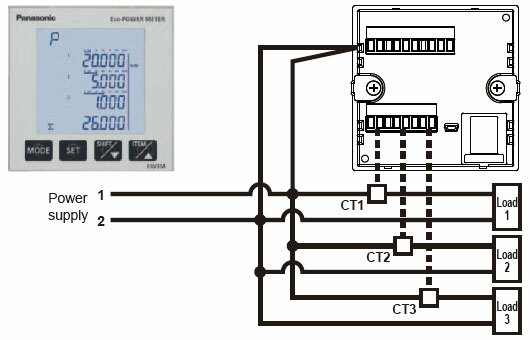 Capable of simultaneously measuring up to three circuits in a single phase two-wire system of same power supply. Data can be made visualization by connecting the meter to DLL* and logging the data. Alarms can be e-mailed to mobile phones or other equipment. *DLL is the abbreviation for Data Logger Light. 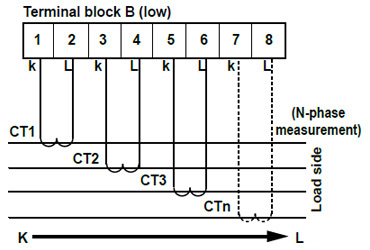 You can measure power with a direct connection to an already-installed large-capacity general-purpose CT (secondary side 1 A / 5 A type). * The dedicated CT for Eco-POWER METER® cannot be used. Use a CT with a secondary side current of 1 A / 5 A. 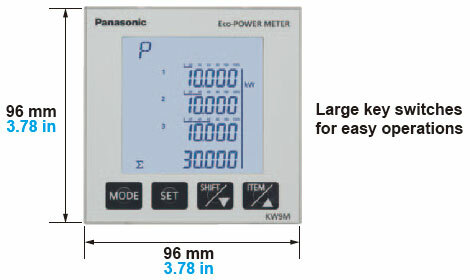 The measuring accuracy of the Eco-POWER METER® does not take the CT error into account. 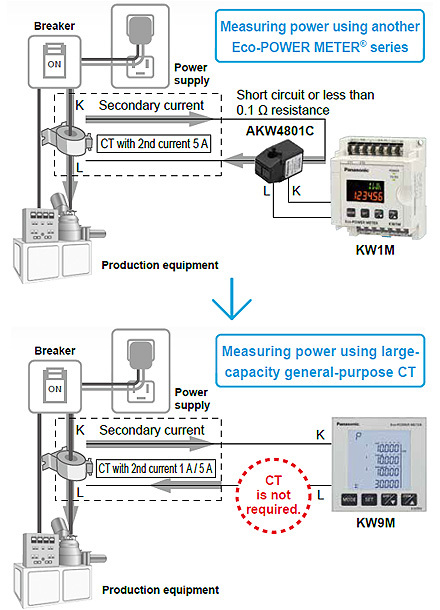 Other Eco-POWER METER® series (except AKW8115) need to use two CTs for measurement. KW9M is ready for direct input from only one CT, allowing higher accuracy measurements than with other Eco-POWER METER® series. 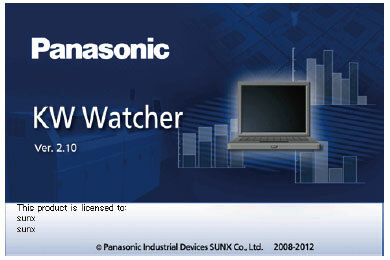 KW Watcher Go to data download. 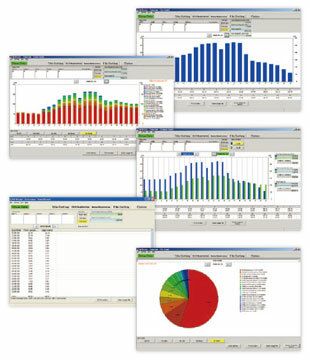 Free software to create graphs from data collected by DLL for energy management. KW Watcher cannot simultaneously display values of three phases in graphs. 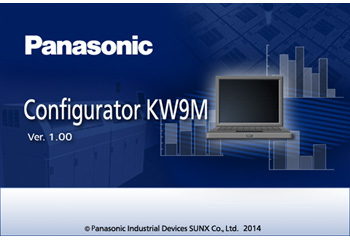 Configurator KW9M Go to data download. 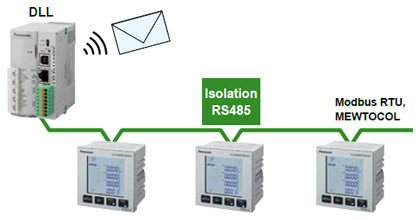 As you can set up several units at one time, setting time is reduced. You can readout the setting value from a unit and copy the setting to another unit. You can select register No. and set it up. 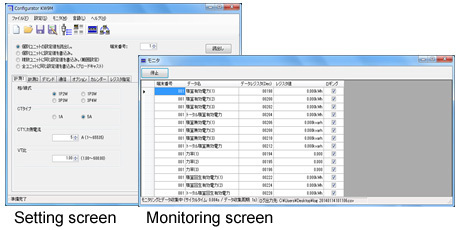 Monitoring and logging of measuring values are available. * 30-min demand method is also selectable for use in Japan. Users set the time span for demand calculation to an arbitrary value between 1 to 60 minutes (in increments of one minute). The next time span starts after completion of the current span. Inverter equipment and fluorescent lighting fixtures are harmonic sources and can have adverse effects on precision equipment, thereby causing it to malfunction. *KW9M Standard type support only THD measurement function. 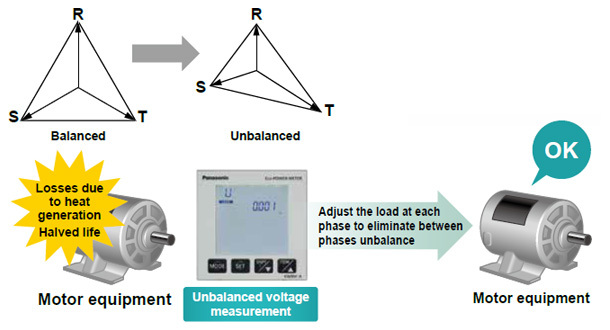 If there is an unbalanced load due to a V-connected transformer or a heater, a voltage imbalance occurs between phases, and the motor torque becomes insufficient, causing a rise in heat or reduction in product life. 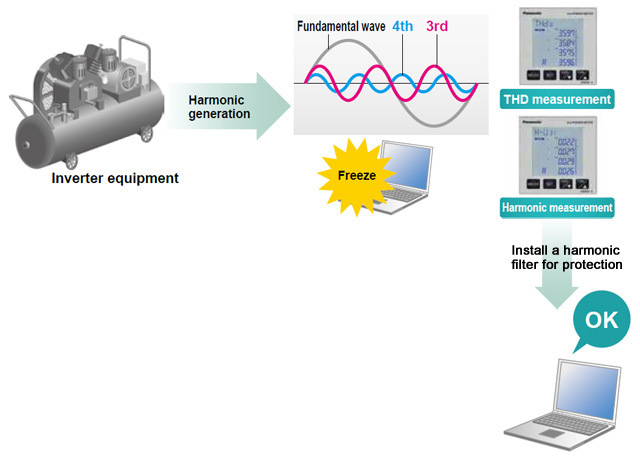 Simultaneously measures data including that other than electric energy (production amount, flow rate, etc.). 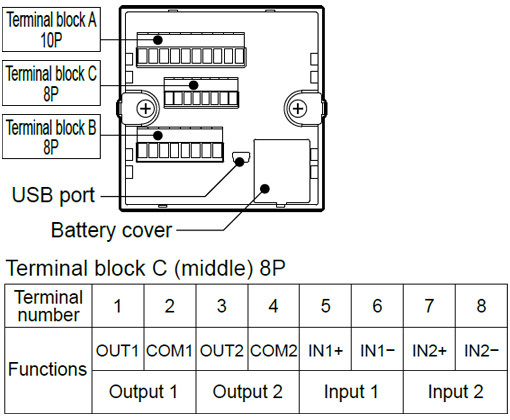 The PhotoMOS output allows for connection of NPN input and PNP input devices. Ready for alarm outputs, which are frequently used. * Time stamps and power quality data can be confirmed via communication. They are not displayed.